I am married to a wonderful man and we have 3 cats, a bunny, a dog, a hamster and several fish. We have a baby due January 1st. 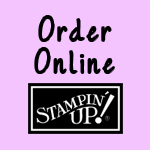 I stamp in my free time (which isn't as often as I'd like) and would one day like to make my Stampin' Up! business a profitable business. stamping, gardening, watching movies, and spending time with my family, cooking, reading, watching sports (especially the red sox and patriots games), friends and pets.